These are the three underpinning principles of continued success for Texas-based Myrtle Consulting Group, an operations consulting firm that aims to transform operations, or at minimum, improve the efficiency of some of the world's leading manufacturers by leveraging novel methodologies and cutting-edge technologies that deliver revenue-driving performance improvements. Myrtle focuses improvement efforts in all areas of operations, including sales and operations planning, production, maintenance and reliability, supply chain optimization, organizational effectiveness, and leadership development. Supply chain optimization is becoming an area of increasing focus for their clientele. Effectively managing the supply chain in today’s fast-moving enterprise landscape has become more complicated than ever. Adding to this complexity are the new disruptive technologies, constant changes in suppliers and outsourcing strategies, and the need to manage multiple trading partners with disparate systems. But the key challenge nearly every company faces is the difficulty in connecting the supply chain dots. 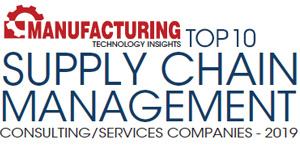 Organizations require a solution that can help them eliminate supply chain complexity, simplify the process, and optimize the overall operational performance. This is where Myrtle comes in. By incorporating a practical, needs-based approach, the company provides custom solutions that not only optimize supply chain performance but also catalyze lasting business transformations. Melvin Bosso, vice president of the company, says, “At the heart of Myrtle’s consulting process is our customers. Our core purpose is to reduce the number of variables that hinder clients’ decision-making ability and guide them in achieving their operational goals more quickly.” In line with this, Myrtle uses a proven methodology to craft custom solutions based on each client’s unique supply chain requirements. This phased approach is designed to drive consistent operational improvement by evaluating and addressing all of the specific challenges in the organization. For instance, one of the most common issues faced by every manufacturing company is excess inventory. “Driven to satisfy consumer needs, companies often increase the volume of their products in stock, making it difficult to eliminate unnecessary stock keeping units (SKUs),” explains Bosso. Myrtle, however, has the expertise to change SKU proliferation to SKU rationalization and help companies identify the strategic SKUs that drive profits. “Our expert team analyzes the benefits of adding, retaining, and removing products that are either positively or negatively impacting the bottom line, and accurately forecasts the financial impact of SKU rationalization before implementation,” adds Bosso. At the crux of Myrtle’s distinct approach to engaging with customers are seven core values—Results-oriented, Ethical, Strategic, Pragmatic, Engaging, Committed, and Tenacious—represented by the acronym RESPECT. These principles characterize the way Myrtle interacts with clients to comprehend the requirements essential to improve the decision flow and performance in their organizations. “Adherence to these tenets is critical to ours as well as our clients’ success. It is one of the factors that truly set us apart in the manufacturing landscape,” states Bosso. For the future, the company is planning on expanding its team by hiring individuals that are passionate about helping organizations witness lasting business transformations. Myrtle is also working on a proprietary machine learning engine that will provide enhanced data analytics to improve customers’ business processes. The approach is called Operomics and it will combine human intuition and domain expertise with advanced statistical analytics and artificial intelligence to deliver long-term, sustainable operational excellence.